Source: Government Development Bank for Puerto Rico. The correlation of the growth rate of this indicator with GNP at the annual frequency over the 1982-2016 fiscal years is 0.78, R2 = 0.91. The components of this indicator are nonfarm payroll employment, electricity generation, gasoline sales and cement production. The indicator is calculated in a manner similar to that used by the Conference Board for its coincident index (description here). The decline from August to December was 14.3% (log terms), or an annualized rate of 43%. Estimates of aggregates are hard to come by. Brad Setser has presented some of the most comprehensive assessments of the challenges Puerto Rico has, and is now, confronting. Here I rely on IMF World Economic Outlook data and forecasts for data. Here are the data in levels and growth rates (calculated as log differences). Figure 1: Log level of Puerto Rico GDP in constant dollars (blue) and population (red), normalized to 2016=0. Light green shading denotes estimates and IMF projections (see page 236 of IMF WEO. Hurricane Maria made landfall September 20, 2017. Source: IMF World Economic Outlook database (April 2018), and author’s calculations. 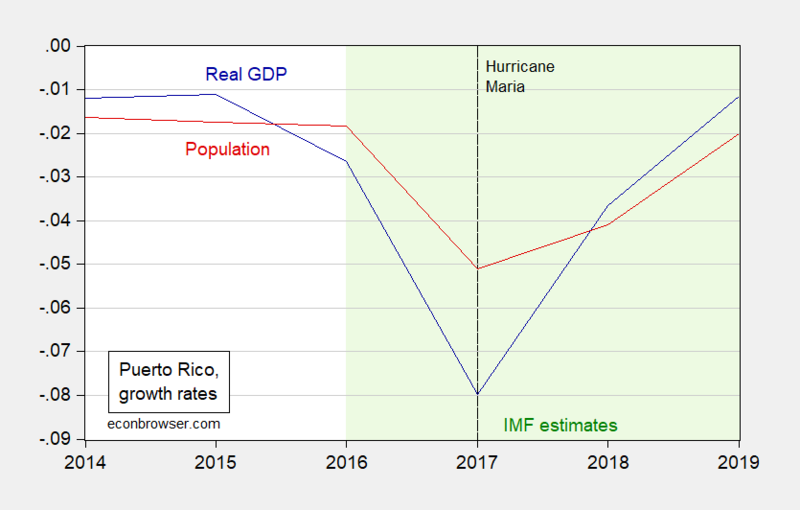 Figure 2: Growth rate of Puerto Rico GDP in constant dollars (blue) and population (red), both calculated as log first differences. 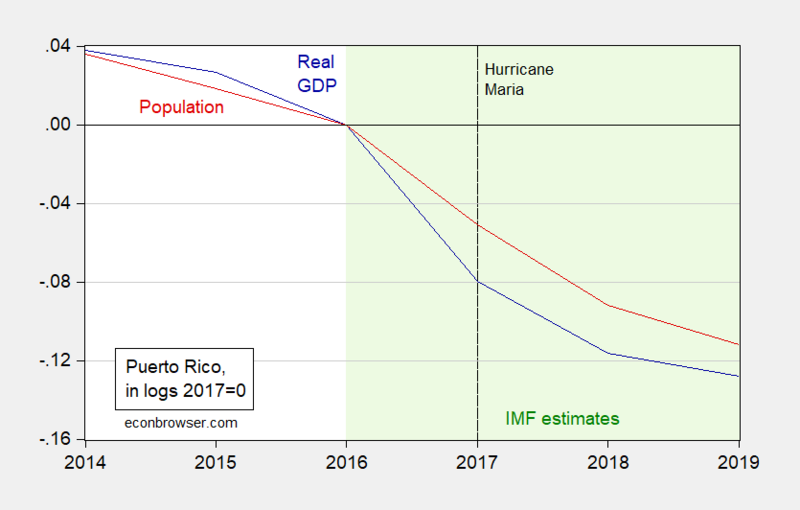 Light green shading denotes estimates and IMF projections (see page 236 of IMF WEO.. Hurricane Maria made landfall September 20, 2017. Source: IMF World Economic Outlook database (April 2018), and author’s calculations. Note the 8% (log terms) shrinkage in Puerto Rico’s GDP in 2017 (7.7% in non-log terms). No US state has experienced a comparable decline in the past 20 years, save Michigan and Nevada in 2009 (although keep in mind that the PR decline is concentrated in the last 4 months of the year). Brad Setser assesses the government’s rosy projections (regarding GNP, not GDP). It is hard not to conclude that leadership on this issue is sorely lacking. Over 3 million of our fellow Americans wiil suffer as a consequence. This entry was posted on May 30, 2018 by Menzie Chinn. Notice how this peaked in 2005? That was the end of the section 936 tax dodge for big pharma which applied as long as they used Puerto Rico as related party contract manufacturers. Section 936 was bad tax policy for the US but the problem with the repeal of his tax dodge is that our sad political leaders had no replacement for its beneficial effects on the local economy. And of late our sad political leaders have basically given up on doing anything for this economy. Peak oil. The use diesel in their power plants. Although the on the ground reality of this is dark, I think it’s great that Professor Chinn and Setser are giving this the attention it critically deserves. I know they will quantify this in a way it needs to be quantified and with hard facts/numbers (or certainly the best available under the circumstances in Puerto Rico). I read the NYT pretty regular, have I missed something that they aren’t covering the suffering in Puerto Rico?? No 5-star hotels available for the pampered media types?? No Starbucks nearby?? Aaaaawww!!! The babies need their sugary coffee purchased at 10 times sane prices or they won’t feel “accomplished” as “reporters” anymore. Well I guess those “journalists” can stay in DC and ask Sarah Huckabee how she feels about it and then they can all fake getting choked up together like a big family of narcissists that pretend to get choked up about sh*t they clearly don’t care about. Not that thinking GDP is taking a hit from the Hurricane, but all your statistics from 2016 and later are estimates (yes I read how you justify the estimates and it seems a reasonable approach). When are measured numbers coming out? Thank-you for the links to Brad Selzer. If nothing else, he is at least up front about how badly Puerto Rico was performing before the hurricane. As for your last sentence, leadership should be first with the territory. The Governor seems weak, and the Mayor of San Juan, a hopeless incompetent. But you get what you vote for, just ask Venezuela. Ed Hanson: Dr. Setser has provided several comprehensive assessments. I would note my graphs indicated negative GDP growth even before 2016. So if Iowa suffered a two year downturn which resulted in the Iowa economy (with about 3 million people) being about 11% smaller over two years, you’d say “tough luck, should’ve elected better leaders, you’re on your own”? It is not up to me to say, Menzie. And I never said anything about help from the outside. Only that those in authority in P.R. are pathetic, and the local response to the hurricane reflects that. As will the efficiency of outside help. And by the way, your first graph does show how you attempt to bias the look of statistic. Puerto Ricans have been voting with their feet at least since 2014. Population change has been negative since then. As in below zero. And since you attempted to put words in my mouth, what do you have to say about your socialist paradise of Venezuela? I would very much like to read. seems to suggest the Puerto Ricans deserve what they got. OK, so if there’s a drought in Iowa, and not enough provision was made for safeguarding against that, Iowa deserves what it gets. Interestingly, I’ve only made one matter of fact mention of Venezuela in 2007 (here). Jim made six posts mentioning Venezuela, and guest commenters four. Seriously, what are you babbling about me and Venezuela? Most of your comment here is abhorrent but I agree that the governor is weak. But Trump loves the man as he says nice things about Trump. I never said a word about outside help. I only commented on the incompetence of P.R leadership, and that incompetence reflects in the poor local response as well as reducing the efficiency of outside help which must coordinate with the local government. So why am I babbling about Venezuela? A) What is happening in that country is important, and B) your deafening silence on the subject can be chalked up to the leftist principle of never speaking bad about another leftist. What is happening in Venezuela is an immense tragedy. It should be fodder to any macroeconomist. Hyper-inflation, food shortages, mass migration. All from a country which may have the largest petroleum reserves in the world. So why aren’t you posting on it? What is happening to Midwest states or even Caribbean islands pale in comparison. Is that serious enough for you? Ed Hanson: Well, if it will mollify you, I’m happy to say that Venezuela is a disaster in the tradition of all central command economies. You really think central command economies are one small step away from mixed market economy, don’t you? That you think so is a statement on your truly ideologically twisted view of the world. It is a small step. All they have to do is liberalize prices in Vz and the economy will right itself in short order. Steven Kopits: Should’a told Deng Xiaoping. Would’ve saved China a bunch o’ trouble. There are two differences in Vz, Menzie. The first is the state ownership of assets. To revive an economy, you really need to privatize those. Private markets still work in Vz, to the best of my knowledge. That is, you can still legally manufacture and sell, say, candy bars — but at a below market price. So liberalizing the price will do a lot, although I would judge the damage to PDVSA now as lasting. The second is cultural — and this is the big one. If you lose the skills and the habits of the private sector, they can take a very long time — many years — to reconstitute. That’s a lesson of Hungary, where I did indeed live through the transition. Ed Hanson: I am commenting on Puerto Rico, which does seem consequential. That you think Puerto Rico’s plight pales in comparison to that of Venezuela given the thousands of American citizens that possibly died as a consequence of the administration’s abject failure of a response speaks volumes. I realize I’m “preaching to the choir” here when I tell you this Menzie, as I think your perception of this particular issue is very near the same as mine. But I think the subtext of Ed Hanson’s comments is that Hanson doesn’t view Puerto Rico as part of America anymore than Hanson views Venezuela as part of America. If you could give certain Americans (“certain Americans” read here as MAGA) truth serum, how would they view Taiwan as any different than China?? If Trump can throw his weight around on trade with China (assuming that’s what he really wants to do) how much does the VSG or his worshipping fans care the democracy of Taiwan suffers in the process?? Of course, if you call Hanson out on this, he will do the “rtd” style slither back behind his rock, saying you’re “putting words in his mouth”. This type no more cares for Venezuela than they care for rabid stray cats wandering the neighborhood. What bothers Hanson is his sycophantic love for Trump is put in doubt, when it’s clearly shown Trump could care less if all Puerto Ricans dropped dead tomorrow morning. Moses Herzog: Yes, I thought it was telling that Mr. Hanson referred to “Caribbean islands”. Key West is an island nearby. But when it got hit by a hurricane, FEMA rushed to its aid. Now I love Key West as it is PARTEEE Time 24/7. And Ed would love the fact that it is dominate by white people. One has to wonder whether Ed realizes why FEMA was formed in the 1st place. Or does he not realize that Puerto Ricans are American citizens. Pgl, I see you are exaggerating again. “Key West is an island nearby. But when it got hit by a hurricane, FEMA rushed to its aid.” As I already pointed out Florida as a standard procedure asks for support early: “six days before Irma made landfall.” BTW, Florida has a Republican governor. From your responses you don’t seem to know the difference between an island with road access from the mainland, Key West, and an island with only air and sea access, Puerto Rico. So with an early request and road access, FEMA was able to pre-stage and rush help down the road to Key West. Without an early request for help and limited access FEMA was not able to pre-stage on the island and could only wait until air and sea access was possible. Does that help explain the minor differences and why early request is really important? Or are you still blaming Trump for Puerto Rico’s failure to timely notify and their geographic difficulties. Never mind I already know your answer, and now surprisingly Menzie’s. This is categorically false, Menzie. Excess deaths in PR through year end, those recorded by the Statistics Office, numbered only 654. Most of these occurred in the last ten days of September and the whole of October. While the power outages there were exacerbated by the state ownership of PR’s utility, a large portion of the excess deaths would likely have occurred regardless, given the terrain and the strength of the hurricane. Thus, perhaps 300-400 of the excess deaths would have occurred regardless of steps anyone could have made to fix the power supply. The remainder can be attributed essentially to the state ownership of the power utility. I would note that excess deaths fell by half in December. Thus, the data suggests that the hurricane accelerated the deaths of ill and dying people, rather than killing them outright. I would expect the excess deaths at a year horizon (through, say, Oct. 1, 2018) to total perhaps 200-400. Still a notable number, but certainly not 4,600. Steven Kopits: I have two observations. (1) The US Army made official body counts in the counterinsurgency programs implemented in Vietnam, as well. I’m not sayin’ people were lyin’…but not sure how much credence I’d put on them. (2) So if somebody died a few months earlier than before, they should not be excess deaths? I’ll remember that on Father’s day coming up. We’ll be able to check this hypothesis later on; if you are correct, we should see an undershooting of deaths in the future, as the previously culled and infirmed do not die on schedule. Puerto Rico is not a war zone. Recording deaths in most places is a pretty standard, bureaucratic process because it relates to crime (ie, cause of death), health (epidemiology), and an insurance and inheritance. PR is not Vietnam (and frankly, I think they would be more than a little offended by the comparison). You may be arguing that the Puerto Rico Registry was overwhelmed and unable to record and report deaths real time. I have worked with a couple of vintages of these numbers, and the revisions — including Hurricane Maria period — have typically not exceeded 1%, mostly upward. On a typical month of 2500 deaths, that’s about 25. Further, we see a marked deceleration of excess deaths into November, and an explicit reversal in December. If the Registry was catching up on paperwork, we should have seen recorded deaths increase, not decrease. Excess deaths can only be measured with respect to a specific time frame. The Mortality study specifically measured excess deaths from the hurricane through year-end 2017, so we use the same metric. The maximum count of excess deaths was 1,300 through November. If you want to say how many people died prematurely, that would be the maximum number. If you wanted to know how many died prematurely during calendar 2017, it was 654. As you point out, premature deaths will reverse in the statistics, with half the total gone in December alone. I would guess we’ll also see some reversal in January, maybe 200 or so at a guess. When do we talk Mexicans? There’s a lot more at stake there. Steven Kopits: See addendum to post. Also, this: Google is calling Republicans Nazis. Lead of Drudge. Looks like my Conservative Hierarchy of Needs is timely. You should feel free to pull the pyramid and discuss. Are Republicans really fascists? The pyramid tells us. This release takes on heightened importance given Mr. Steven Kopits’ assertion that the methods used by the Harvard School of Public Health failed to reconcile survey results to observed deaths. Mr. Kopits, in an analysis entitled “Reports of Death in Puerto Rico are Wildly Exaggerated” (https://www.princetonpolicy.com/ppa-blog/2018/5/30/reports-of-death-in-puerto-rico-are-wildly-exaggerated) notes that, during the period covered by the study, Sept. 20 – Dec. 31, 2017, officially recorded deaths in Puerto Rico totaled only 654 more than during the same period in 2016. By contrast, the Harvard study estimated 4,645 excess deaths on the same basis. Thus, the Harvard survey suggests approximately 4,000 more persons died in the aftermath of Hurricane Maria than were recorded by Puerto Rican authorities. Kopits argues that this is a large discrepancy, and the onus falls to the Harvard team to demonstrate that these excess bodies must plausibly have existed in some form at certain locations. He maintains that the failure to reconcile survey to observed data ex-ante suggests a material lack of quality control procedures prior to the publication of the study. The wide range of the 95% confidence interval — 793 to 8498 excess deaths — does not mitigate this responsibility, in his view, as reported deaths came in below the 95% confidence interval. Moreover, the 4,600 central estimate was carried almost universally in the media, including through outlets like PBS, CBS, CNN, NBC, FOX, NY Times and LA Times, among many others. An op-ed in the NY Times specifically relied upon the central estimate to impugn the disaster response of the Trump administration. Therefore, Kopits contends that at issue is not only the range of estimates, but that the Harvard team’s central estimate appears to have created a materially distorted and misleading interpretation of both the situation on the ground and related US federal government responses. He argues that the Harvard team must either demonstrate that 4,000 bodies in Puerto Rico were not recovered through year-end 2017 or retract their central estimate of 4,600 excess deaths. I think this is going to be one of the more interesting socio-economic “experiments” that has been tried in awhile. Hopefully Professor Chinn will be watching this, at least peripherally, with that expansive mind of his. I’m relatively neutral on whether this can work or not long-term and under what constraints/conditions. However, if it’s between this and the millionth tax cut for the Koch brothers and friends, I have very little ambivalence on the issue—FULL SPEED AHEAD. Some European banker was saying “the world would come to an end” (slight embellishment there, but actually not much) if they tried this in Italy. Really??? How the F___ do you know that until you give it a try?? It’s as if the experiment has such a decent chance of working out well, they are scared shitless just to run it up the flagpole even once. Menzie, “It is hard not to conclude that leadership on this issue is sorely lacking. ” Yup! As was the local leadership in New Orleans during the hurricane Katrina disaster. I hope you were not blaming National leadership, which as always was imperfect, but adequate even though hamstrung by the PR political and physical infrastructure compounded by years of public and private malfeasance. At least in New Orleans some of those local leaders went to jail for their malfeasance. “I hope you were not blaming National leadership”. I do blame the complete lack of national leadership for both Katrina and what happened in Puerto Rico. The failures of FEMA and the general Federal government are well documented in both cases. But at least the state of New York sent assistance the day after Maria struck. Cuomo did his job. Trump utterly failed. Then again – Trump never really tried. Pgl, there are several fascinating similarities in local inadequacies between PR and NO hurricane response. “Puerto Rico was slower than Texas or Florida to make its first formal request to EMAC for help from other states. Texas first requested help onthe day that Harve smashed into the coast northeast of Corpus Christi and days before it began flooding the streets of Houston. Florida was even faster, making its first request six days before Irma made landfall. LA Governor Blanco requested aid the day before Katrina hit. She and mayor Nagin mishandled the NO evacuation. Pgl “But at least the state of New York sent assistance the day after Maria struck.” BTW, how did NY get its Maria/PR assistance to the island the day after? IIRC the ports, air and sea, were damaged and closed. Was assistance actually sent or preparations started to send? Or is this just another of your hyperbolic responses? If a President has to wait for the local authorities to formally request assistance – then he is no President at all. Lord the excuses for this racist incompetent could fill the Grand Canyon. Jimmy Carter made no excuses – neither did Bill Clinton or Obama. They acted. I guess CoRev has a very low bar when it comes to Republican Administrations. But we do await his next set of excuse rants with great joy! pgl: Once you understand CoRev’s and Ed’s Weltanschauung that Puerto Ricans are not true Americans (wrong language, wrong everything), then all makes sense. Pgl, I see you dodged the question, and changed subjects. caught out again, eh? It’s easier to discuss your own points unless, of course they are wrong. To complete your NY hyperbole, much aid is provided by the states and by law they must wait until requested. I’ll repeat my previous point: “Puerto Rico officials didn’t make their first formal request for interstate assistance until Sept. 21, the day after Maria struck,..” So state responses could not be implemented until then. Another point about the delayed request: “The Robert T. Stafford Disaster Relief and Emergency Assistance Act, 42 U.S.C. §§ 5121-5207 (the Stafford Act) §401 states in part that: “All requests for a declaration by the President that a major disaster exists shall be made by the Governor of the affected State.” A State also includes the District of Columbia, Puerto Rico, the Virgin Islands, Guam, American Samoa, and the Commonwealth of the Northern Mariana Islands….” https://www.fema.gov/disaster-declaration-process So get a clue of how these things are structured. Yes, the President has to wait for the local authorities to formally request assistance. Your lies are getting big enough to fill the Grand Canyon. Your infantile, angry unsupported and unsubstantiated ranting, your need to contradict conservative views, and your zealous meaningless comments are getting tedious. Let’s not forget that Governor Christie stayed in Florida during Sandy and the days after. But he ran for President based on his alleged excellence performance. Oh wait – the excellence came from Obama and FEMA. But then we have to give Christie a lot of credit for using the relief funds to stroke his political cronies. Huh – he would have been GREAT in the Trump White House! one would hope the federal response would have dealt with this issue, rather than another state. but i fail to see how the timeline for official request for assistance really makes a difference when us citizens are in peril. if kansas is the recipient of a nuclear missile from north korea, does the president wait until after detonation to make a response? why use a bureaucracy as an excuse for failure to act? Closed ports dur to damage: “one would hope the federal response would have dealt with this issue, rather than another state.” Indeed! How fast can we move the needed heavy equipment? Hospitals too were damaged, and the USNavy provided hospital ships, but how long does it take to provision, crew them and steam to Puerto Rico? Days and weeks! BTW, I know that the call for crewing went out before Puerto Rico’s request for aid. And it is this lack of knowledge, ignorance, that allows you to misunderstand why: “but i fail to see how the timeline for official request for assistance really makes a difference when us citizens are in peril.” Moreover, you know that Puerto Rico is a territory with a history of active rebellion for separation from the US and not a state? Why would any President want to send Federal Troops, Hospital ships, helicopters, transports and their support staffs, engineers, etc. without a request? That act has a name, INVASION. When a group counts on the Federal Government as ultimate source, then it is common to think they are above the law, or expect it to be so to salve their own ignorance. After all if you are a liberal it is about your feelings and not law and logic. Not lately. You’re stuck in the deep past. PR independence has gone to a referendum many times and it has been soundly defeated. But I do recall several states that did stage an active and bloody rebellion that killed over half a million Americans . Ever hear of the Confederacy? But yet Trump seemed to find a way to help those states. Why is that? 2slugbaits: Rebellion in defense of slavery is acceptable in CoRev’s book. Menzie and 2slugs, what an amazing display of weak arguments. Menzie — racism? Is that oft repeated claim all you have? 2slugs, you just confirmed what I said, a history of active rebellion. i must say, your comments simply become stupid with time. i suppose we don’t support hawaii under a north korean missile attack unless the state issues a request for federal aid either. you support citizens of your nation. period. Baffled, where. did. you. learn. to punctuate? National defense is not the same as support after natural disasters. Defense is provided for in the Constitution, Federal support for natural disasters is not, although we have done so since 1803, finally being codified eventually in the 1950 Federal Disaster Relief Act. The states protect their own rights and it is one of the reasons we have the Federal acts and procedures to clarify responsibilities. As I already pointed out it takes a request before the Federal resources can be applied. That is still true in times of a natural disaster. so corev is willing to let millions of us citizens die due to the need to follow bureaucratic process. most citizens in such dire situations would disagree with this position, i would imagine. baffling: Let’s not overstate — it’s just thousands (we don’t know his threshold, it might be tens of thousands, or 100,000, although it could be millions). Ed Hanson You’ll have to do a better job of explaining yourself because your comments seem to contradict themselves. On the one hand you criticize the PR governor and San Juan mayor for not being strong enough leaders. So apparently economic success is a function of strong centralized political leadership. But then you bring Venezuela into the discussion. That’s weird because no one ever accused Hugo Chavez of being a weak leader. So if strong leaders are the key to economic success, then how do you explain Venezuela’s economy? Two things about Venezuela strike me as relevant here. First, Venezuela is another example of what happens when a country uses its endowment to support current period consumption rather than saving & investment. A good illustration of this is to compare the way Thatcherite Britain used its income from North Sea oil to the way “socialist” Norway used its claims on North Sea oil. Thatcherite Britain used the income from the North Sea oil as an opportunity to increase current period consumption by lowering taxes. By contrast, “socialist” Norway invested the income from North Sea oil in sovereign wealth funds. How’s that working for the British? Venezuela under Hugo Chavez followed the Thatcherite model. The second thing that’s relevant here is that in the case for both Britain and Venezuela the decision to immediately consume the national endowment came from strong leaders who based their decisions on political ideologies rather than formally trained economics. In the case of Thatcher it was conservative political ideology and in the case of Chavez it was Marxist political ideology. But in both cases it was political ideology and not formal economics. In the case of “socialist” Norway the decision to invest in sovereign wealth funds was based on formally trained egghead economics. I see a lot of that same distinction on this blog. The economic views of many commenters here is based on the political ideologies of people with no formal training in economics. Am I being too subtle here? That’s the heading of the graph as reported in the link. Sure the 1982, 1991, and 2001 U.S. recessions had a negative impact on the Puerto Rican economy. After all this economy served as contract manufacturers for Big Pharma which was driven by the massive tax benefits of section 936. And yea the Great Recession may have been part of the reason for a collapse since 2005 but the big reason was the expiration of those section 936 benefits. Look – in my view section 936 was bad US tax policy but we never bothered to do anything else to make sure Puerto Rico’s economy did not collapse. I’d expect a good portion of the economy would go ‘underground’ during the recovery. Why would that be? 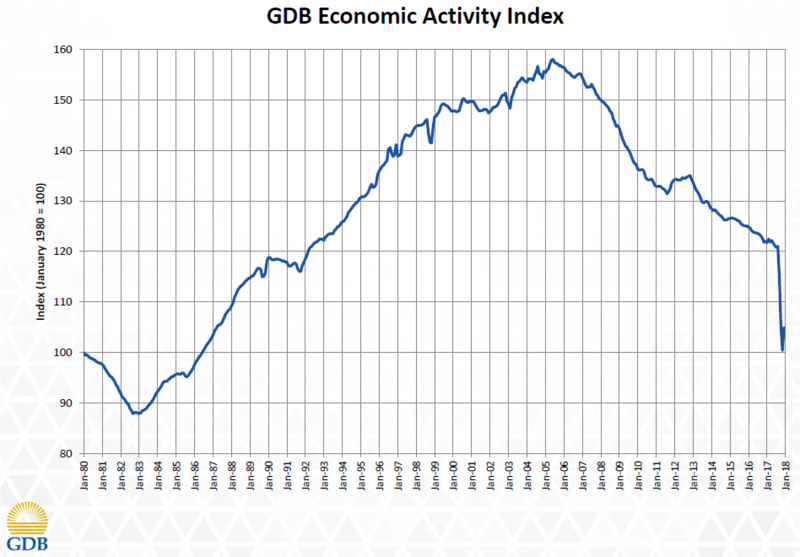 Yea – it is easy to dismiss a drop in economic activity this way. But is there a shred of evidence to support your excuse here? ‘Anti-Immigrant Sentiment Is Most Extreme In States Without Immigrants’ is the title. We get a lot of anti-immigrant rants here. I wonder if the usual suspects all live in the hills of Tennessee drinking home made whiskey all day. Pgl, get a clue! Most of the anti-illegal comments here are from conservatives who do not live in Democrat run urban areas. But, i do admit to drinking home made whiskey, shooting my guns, saluting the flag, practicing my religion, and searching for other dumb comments such as yours nearly every day. I also admit you are becoming the bullseye of my targets because you are so prolific with the dumbness. CoRev: Gee, I’ve had homemade rice whiskey, I’ve shot a gun, I salute a flag, I practice my religion, but I *do not* threaten people as bullseye’s. Don’t do that again, or you’ll be banned. Menzie I wouldn’t worry. CoRev has already told us that he’s such a bad shot that he needs a 100 round magazine to shoot a squirrel. And he’s just as poor of a shot with his keyboard. CoRev’s threats are mild. I get much worse from the Usual Suspects over at Economist View. And those Usual Suspects pretend they are progressives. Go figure! Menzie,sorry won’t do it again. Target was meant to be in reference to my pgl responses. I Left off the reference to searching for other dumb comments. 2slugs, where and when have I claimed to own a gun requiring a magazine? That was another weak response. You’re the one who kept telling us the hunting value of semi-automatic rifles and shotguns with large magazines. Remember? 2slugs, another weak response requiring your hyperbole:” You’re the one who kept telling us the hunting value of semi-automatic rifles and shotguns with large magazines.” Why must you exaggerate to make a point? I never made such a claim. The numbers support the number of semi-automatic weapons used in the shorting sports. Even you understand use of these large magazines is limited with your explanation that most hunting is restricted to 5 or less shots. It gets a bit tiresome responding to exaggerations. My God you socialist just can’t stop. slug, Your description of Venezuela was the possibly the vaguest, most pathetic excuse of a general economic description of government action. Let me put it plainly to you and just maybe you could bring yourself to describe socialism in a truer matter. The trouble with Venezuela is it chose and its leadership acted to bring socialism to the country. It usurped private property, it nationalized leading industry, and it went overboard in redistribution. As many socialist nations do today, it intentionally destroyed its own currency. This is not present consumption of future resources, it is blatant and accurate socialist policy0, pure and simple. And that as it always is the death of freedom. Menzie, are you down to citing ridiculous death studies. Did you even bother to read Steven’s analysis? Yeah, I read your careful use of the word possible. A pathetic out, but since most here will accept your word without judgement, it will do. Ed Hanson Venezuela nationalized their oil industry over 40 years ago and during most of that time it was considered one of the wealthiest countries in the hemisphere. Don’t you think you’re building in an especially long lag? And lots of countries nationalized their oil industry, not just Venezuela. That may or may not be a good thing, but it hardly explains Venezuela’s current problems. And in other posts you keep insisting that Norway is a “socialist” country, but it seems to be doing pretty well. And oh yes, they nationalized their oil industry over 45 years ago. Norway also does a lot of income redistribution. And there are plenty of repressive countries in this world that do pretty well economically, so I think you’re going to have a hard time making the argument that political freedom is necessary for economic growth. What makes Venezuela such a basket case is that the government didn’t use its oil resources to invest in other areas of economic development. It essentially hitched its wagon to forever rising oil prices and told its people to take the rest of the day off…sort of like Alaska. When the price of oil fell, so too did Venezuela’s main source of income. This is what happens when political ideologues make economic policy. It doesn’t matter whether those ideologues are Marxists in Venezuela or Thatcherite Tories in Britain; it always ends badly. Check out Codelco. Chile nationalized these copper mines a long time ago. And yet it files Annual Reports. I guess it has minority shareholders. Your comment is excellent but permit me to focus on the line that cracks me up. Yes Alaska’s economy took a hit when oil prices fell. Good thing for it that the liberal states of California and New York do not mind that they subsidize Sarah Palin’s homeland. CoRev – excusing Trump’s incompetence with another weak argument – PR did not ask for assistance on time? I would say that is the stupidest comment ever except you also claim there is great road access to Key West. Clearly you have never been there. The road is over water and very narrow. Rushing aid by air and sea would be much faster. BTW – we all knew Maria would hit Puerto Rico hard. A real President would have sent aid early there as well if he cared about the citizens. He doesn’t as he is a racist. You do not care about them either – clearly. I presume you are similarly racist.